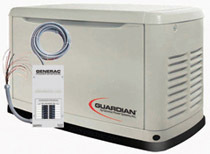 The NEW Guardian 17 kW standby generator provides the quietest, cleanest and most affordable pre-wired, pre-packaged power protection on the market. It comes standard with a 16 circuit automatic transfer switch that protects most critical circuits in your home. The only air-cooled engine designed specifically for generators. For ultimate weather protection, Model 5505 features an aluminum enclosure for superior corrosion resistance.